This type of epoxy is an excellent adhesive (and one of my favorites) for bonding glass to glass or fused glass to metal after glass fusing is complete. Epoxied fused glass jewelry pieces should not be fired again in a glass kiln. Sold in hardware stores and other locations epoxy consists of a pack containing separate resin and hardener which must be mixed in equal quantities before use. After you mix it leave it for about 10 minutes (follow makers directions) until it is the consistency of thick honey as I find it is less likely to cause your bail to slide around. It gives you a very strong bond once set. You can either purchase a pack with two separate bottles or a syringe type applicator which has resin and hardener in separate tubes and dispenses equal amounts of resin and hardener when the plunger is pressed. It is very easy to use, just follow the makers directions Make sure you buy an epoxy that give you enough time to put your pieces together. When I use epoxy to attach my rings or bails to my fused glass jewelry I roughen the glass and metal finding first after making sure the parts are clean and grease free. If using separate tubes of epoxy and hardener squeeze equal amounts onto a piece of disposable card stock and mix with a toothpick and apply the mixed epoxy to your glass jewelry piece and then apply your metal finding. Clean any excess epoxy from the glass. Leave your epoxied pieces to set as per the maker’s directions. I find 24+ hours is the best bet. 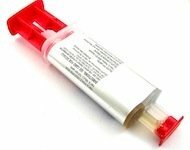 I like the two tube syringe pack as it is easy to use, just dispense the epoxy and hardener, mix and apply.